I am a big listener of podcasts, as you have likely figured out. Some I listen to regularly, some intermittently. A long car ride or being distracted as the app I use flips automatically to the next podcast sometimes brings up a long forgotten one. That happened the other day with Alec Baldwin's podcast, Here's the Thing. His guest was Secretary of the Army Eric Fanning, so I let the podcast play. Without knowing Secretary Fanning, other than as a public figure, I really admire him. He's spent time in the Air Force and Navy too, and he just always carries himself in a way that is so approachable - like he'd be a lot of fun to work for. A: Alec Baldwin clearly believes all Hollywood tropes and stereotypes of the military, and hasn't bothered to dig any deeper. It makes me a little sad that there are so many that probably have the same opinions about the military (not individual members, but the organization as a whole). He's a great actor, but let's be glad he doesn't have a job in any position of responsibility. 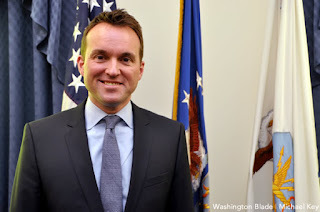 B: Eric Fanning answered all of the questions, even the most ridiculous ones, with intelligence and charm. He clearly thinks highly of the men and women he leads, takes pride in his mission, and regrets the change in administration mostly because he feels there is more work to do to support them. And now I am an even bigger fan!